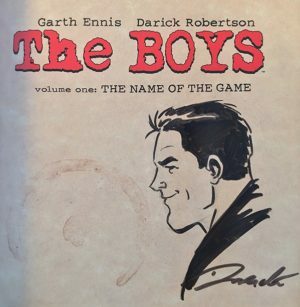 Dynamite Entertainment Offers Limited Darick Robertson Signed Editions of The Boys! September 26, Mt. Laurel, NJ: Coming this November, Dynamite Entertainment is offering a limited release of rare remarked hardcover and trade paperback editions of Garth Ennis and Darick Robertson’s best selling comic book series The Boys, signed and sketched by artist Darick Robertson. Currently, multiple volumes of The Boys are available in limited quantity for order through your local comic shop retailer and will make the perfect holiday gift for fans of this highly regarded comic series. These highly collectible versions each feature a personal touch from the superstar artist. Not only will each book feature Darick Robertson’s autograph, but these Remarked Editions will feature a character illustration and signature from Robertson, making them especially rare. The Boys, a monumentally successful comic book series co-created by Garth Ennis (Preacher, Punisher) and Darick Robertson (Wolverine, Transmetropolitan), introduced a world where superheroes bring peace and justice… but when they abuse their power and authority, who brings justice to the superheroes? The answer: The Boys do. Billy Butcher, Wee Hughie, Mother’s Milk, The Frenchman, and The Female comprise the tough-as-nails crew that keeps the “supes” in line – protecting mankind from some truly deranged superheroes. Darick Robertson is an American artist best known for his work as a comic book illustrator. Highly prolific, Robertson has illustrated hundreds of comics in his twenty-plus years in the industry. His body of work ranges from science fiction characters of his own creation to headlining on renowned classic characters from Marvel and DC Comics (Wolverine, Punisher, New Warriors, etc.). Robertson is best known as the co-creator and illustrator of the satirical comics Transmetropolitan and The Boys. The Boys Darick Robertson Remarked Editions are currently solicited in Diamond Comic Distributors’ September 2018 Previews catalog, the premier source of merchandise for the comic book specialty market, and slated for release in November 2018. Comic book fans are encouraged to reserve copies of The Boys Darick Robertson Remarked Editions with their local comic book retailers.